I feel like I have to do this. 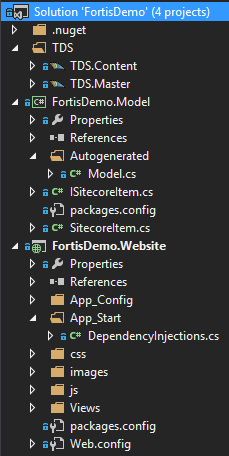 I am going to create set of tutorials about using Fortis framework together with Sitecore. Will walk you through how to create a site using it and show how Fortis makes developers life easier. I have suggested several people to try using it but they complained about lacking of documentation and tutorials. Its time to change it! Installing and using Fortis to your project is actually very simple, but I will try to make it as detailed as I can (some things would be really obvious, sorry). All code mentioned in this post is available here https://github.com/vhil/fortis-demo – you can fork the repository and try it. Source code for my project resides inside ‘fortis-demo’ folder and the Sitecore instance lives outside – in ‘Deploy/Website’ folder. As you may guessed ‘Deploy/Data’ is Sitecore data folder and ‘Deploy/Databases’ – sitecore databases. As long as you reading it, you probably know how to install Sitecore instance so that’s about it. ‘Content Templates’ – list of templates that are going to be inherited by ‘Content Page’ template and some of them are intended to be inherited in any content templates like ‘Content Title’, ‘Content Body’ and ‘Content Image’. I do it like that in order to minimize my template count and reuse same fields in different templates – that helps if you need to change any existing item to another template you won’t lose data if fields are inherited from same templates. ‘Site Root’ is going to be the root node of the website. It is not a content page and is not supposed to contain any presentation. Its not necessarily to have the home page on the site root node. This template will hold settings for the website. Thank you Jason Bert, for “inherits” attribute in your post. As you may have noticed, I do namings of templates and fields using spaces. Fortis is completely okay with that as well as Sitecore and I think it is more editor friendly so in any place where he needs to insert a page or rendering he sees “human friendly” namings. From the other side, as a developer, I don’t need to care about display names. 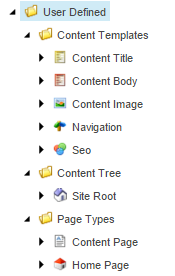 It adds consistency as well so all Sitecore items look the same way. .Website project was created from “ASP.NET MVC Application” project teplate and .Model is just a class library project. We are going to need an IoC container as it is really preferrable with using Fortis. I am used to SimpleInjector as one of the fastest (together with WebActivatorEx to run DI registration on app start) so have installed those but you are absolutely free to use any other IoC/DI frameworks. There is a guideline on how to configure Fortis but will duplicate some of those. // Register the container as MVC IDependencyResolver. That’s done, this file registers all required Fortis classes and in addition registers all Controllers to run within DI in our solution. Congratulations! Now we have everything set up to start using Fortis. 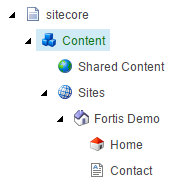 OK, now we need to create our model mapped to our Sitecore templates so Fortis can work with it. There is a guideline on how to do Model mappings for Fortis. It would be crazy thing to do that manually so I will show you how to use Team Development for Sitecore code generation to actually generate model classes. And you can use Fortis Transitus. TDS.Content project is intended to share content for development purposes. I have put there my content tree so you can install those items. Sitecore Deploy folder is set to relative destination which leads outside of git repository to my ‘Deploy/Website’ folder. And now we need to set up the code generation. You can download T4 templates from Fortis repository here https://github.com/Fortis-Collection/fortis/tree/master/TDS/Code%20Generation%20Templates. But I slightly modified those with few changes which I will describe below. I need a base class which I can extend so I have added partial SitecoreItem class and interface for it to be part of code generation and all model classes are now inherited from it. I can write same partial class outside of generated model and extend it. Also SitecoreItem class adds UpdatedDate and Created date fields that are not part of base Fortis.Model.ItemWrapper class. In FortisDemo solution I created that class and extended it with overriding .GetHashCode() and .Equals() methods so I can compare my items by ID and use them inside hash-table collections as a key if I need. That’s about the change and my t4 templates are still in the solution here: https://github.com/vhil/fortis-demo/tree/master/TDS.Master/Code%20Generation%20Templates. Fortis model classes are part of domain model if we are talking about the onion architecture with 3 layers so please use them in right place. 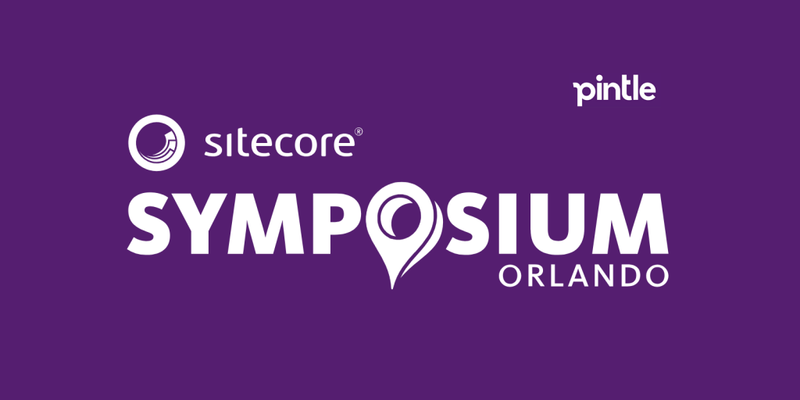 Original : object – instance of wrapped Sitecore.Data.Items.Item. 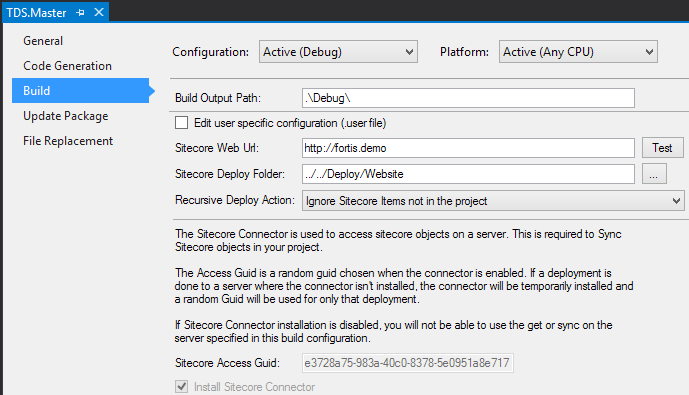 You can simply do a cast and receive the Sitecore API item object. IsStandardValues: bool – has been done for content search filtering purposes. SearchTitle: string, virtual – by default returns item.Name but can be overridden for project-specific needs. TemplateIds: IEnumerable<Guid> – returns all inherited template ids including itself. Heavily used for content search purposes. All methods that returns IEnumerable<T> where T : IItemWrapper returns only items that could be casted to requested type, the rest are being skipped. For example myItem.Children<IContentPageItem>() would skip all child items of templates that are not or not inherited from ‘Content Page’ template. In addition to that, generated model adds list of fields of your templates. Those properties return FieldWrapper types – concrete implamentations for specific Sitecore field types. All Render methods are implemented to execute the FieldRenderer so the Experience Editor is fully supported when rendering fields. Also the field wrapper implements the IHtmlString interface which allows you to render fields without calling the default Render method in the razor views. Concrete FieldWrapper implementations adding required behavior to retrieve field type specific values. 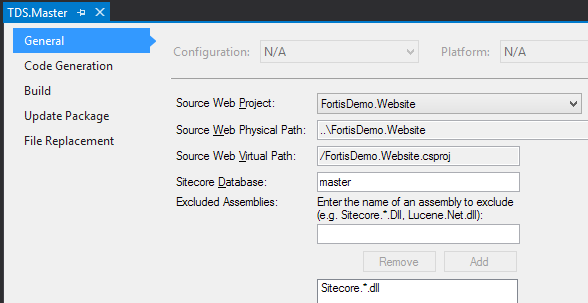 The entry point to Sitecore with Fortis framework is the ItemFactory class. In result the ItemFactory will return you the fully exposed object of the most concrete type even if you requested the very base template interface. In this case if my context item is a ‘Content Page’ I will get an instance of ContentPageItem but hidden by the interface I requested – INavigationItem and I am still able to cast returned object to IContentPageItem. would skip all child items of templates that are not or not inherited from ‘Navigation’ template. Last two methods returns the RenderingModel instance which will be described in next post when we get to create our renderings. and that will wrap context item into your ‘ContentPageItem’ generated model class.